Early last week, my husband and I had the chance to make a quick trip up to Lake Placid, NY – a familiar and much-beloved summer haunt. It came at a good time. We both have been more than busy, and have had little time to ‘just be’ – with each other and with our own selves. We’ve made the trip to Lake Placid hundreds of times. We know the way. And more importantly, we know the subtle expressions of beauty revealed in milestones along the road in from the highway. Chapel Pond. Roaring Brook Falls. Trailhead to Roostercomb Mountain. Marcy Field. In the warm weather, we always open our car windows to breathe in the clear, fragrant mountain air. And we feel renewed and refreshed. Last week as we headed in from the highway, the temperature was hovering around zero. We opened the window briefly, but our reward was a quick freezing blast. The milestones we look for were frozen echoes of their summer selves. Amazingly, there were cars parked along the road, announcing that there were some hardy souls who were climbing . . . maybe even camping . . . in the frigid woods and mountains. The memory of this trip, however, that sticks with me the most – which has returned again and again in the days since we were there – is the sight of the meandering Ausable River, which runs alongside the road. 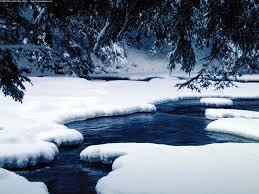 In some places it is a quiet river – narrow, gentle. In some places, it is a roaring river – wide, and swift. On this trip, it was a freezing, and sometimes frozen, river. While I kept wondering how cold it would be to dip my toe in, what returns to me is how the river looked. In the summer, the mountains and rivers and lakes and fields are a beautiful patchwork of colors – lots of variations of green in the trees and grass; hues of grey and brown and deep blue in the rivers and streams and lakes; riots of color in the wildflowers. But in this wintry scene, there were really only shades of 2 colors – the white of the snow and the black of the dark and freezing river. All of the stimulation and pleasure of summer’s bounty is distilled into the simplicity and peacefulness of black and white. As I watched the river by the road on our way in, and on our way out, I found myself feeling peaceful and quietly alive. The simplicity allowed me to shed the ‘loud chatter’ of the summer variety, and breathe in the ‘quiet whisper’ of winter’s beauty. Even amidst the deep cold and long darkness of winter, I find I am grateful for the quiet, simple beauty of black and white. The simplicity of winter’s beauty — you captured this so well, Susie. Thanks for this reminder to appreciate the simplicity and peacefulness of black and white.